VeritasCNC Inc. is a technology innovator, developing Smart Machining products to optimize CNC operations. Our patented strategies integrate cutting edge software with on-line CNC data to make parts cheaper, faster, better. The VeritasCNC Smart Machining products are the first application to implement a practical integration of NC verification software with CNC hardware data. 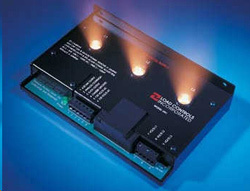 NC verification was pioneered by the principals behind VeritasCNC. 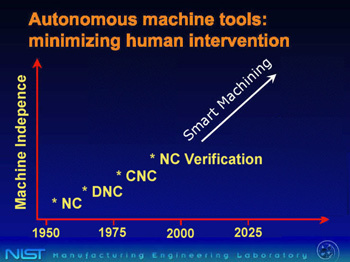 At the 2002 NIST Conference on Smart Machining, NC verification was presented as the most significant advance since the introduction of CNC in the progress towards autonomous manufacturing. The VeritasCNC Smart Machining system will set a similar standard for 21st Century Manufacturing. Ever break a tool? Score a part? Lose tolerance due to a worn tool? Unexpected tool wear can disrupt production and damage parts. Most of the time, you take care to replace tooling. But tool wear is not very predicable and surprises happen. VeritasCNC is developing a reliable tool wear “gauge” that will inform you of the tool’s condition from the very first part. No costly and difficult tool condition monitor training period. The gauge will even tell you what type of wear is happening. Progressive (“flank”) wear is the most common type of wear. But sometimes other types of wear can occur (“notch wear”, “crater wear”, …) that are localized on your tool and can progress rapidly after on-set. Our gauge will alert you to rapidly changing and potentially damaging tool wear. Anyone who has tried to make a hole with a worn-out drill bit knows that wear means increased forces. The relation between tool wear and tool forces has been an academic topic for decades. Research labs have measured tool forces with expensive and complex force sensors. VeritasCNC, in collaboration with our research partners, has developed a simple, transparent strategy for measuring tool forces. Tool forces are complex and rapidly changing at the cutting tip. We have demonstrated that we can measure high-bandwidth tool forces by an intelligent combination of easily-accessible spindle power data and an integrated geometric & physics-based model of the cutting process. If your control has an “open architecture” interface, we can obtain the spindle power directly from the control with no additional hardware. If you have a legacy control, we can measure power with an inexpensive and unobtrusive power meter such as the Load Controls Inc. (Sturbridge, MA) sensor shown here. The spindle power and our intelligent models team up to provide tool forces. We analyze your tool forces, using patented and patent pending methods, to monitor, predict and diagnose your tool wear. For details, read our Technology White Paper. VeritasCNC converts the tool information into plain, machinist-friendly language. You don’t need to be an auto mechanic to drive your car. You don’t need a PhD to use our tool wear gauge. The VeritasCNC Emerging Technology team is developing our tool wear gauge and other smart machining products with support from the National Science Foundation. Use our Contact Form if you would like us to keep you informed of progress and release dates.